Have you found an online vendor selling Mount Gay Eclipse? Mount Gay Eclipse rum is produced from molasses that is double distilled and aged up to 2 years in white Kentucky oak ex bourbon barrels. Mount Gay is the oldest existing rum brand in the world, with it's oldest surviving deed being from 1703. The company developed the use of traditional double copper pot stills, a process that has been in continuous use by Mount Gay ever since its founding. The company's namesake Sir John Gay Alleyne was a good friend of John Sober who purchased the then Mount Gilboa distilleries in 1747. This is a great rum for mixing. However, I typically drink rum neat. So here is my description. It has a mild alcohol scent. Drinking it I notice at first a strong punch of alcohol, but it only lingers a few seconds from the finish. After the first few sips I barely notice the alcohol, and continue to enjoy the rum. At the finish I taste a light vanilla hint. The viscosity is light-bodied and thin. It has a golden-saffron color. Overall, smooth and enjoyable for the price. Usually the best choice at poorly stocked bars. Not the best rum, but certainly not the worst! Basic rum with a good balance of spices. Nose is a bit aggressive initially then get towards chocolate and vanilla aromas. Mouth is balanced, slightly oaky and aligned with the nose. Alcoholic tail..
Of the rums you can find in a poorly stocked grocery store this is one of the better ones. This rum is solid enough, and when I first started with rum, I thought it quite good. Until I tasted some other Bajan rums. Not to disrespect-- more to add context. It's good, but not great. This is a good utility Rum. I like it mixed with Ginger Ale and a slice of Lime. This rum is meant for mixing and not to be sipped. Good for a rum and cola. This isn't a bad sipping rum for those with a few dollars in your wallet. Has a bit of an alcohol bite at first but quickly burns off. Pretty good flavor and worth a return over some lower brands. I love Mount Gay rums, I have the Old Cask 1703 (10/10), I have the XO (8/10) and this one I just bought while travelling and you can still enjoy sipping it... has a lot of flavors for the price and still no added sugar. Its is a good rum... with Mount Gay you never are disappointed. Mount Gay Eclipse has a rum aroma, with notes of rum as you drink it, with a warm, cherry-like, rum finish. Okay, you can tell I'm new to drinking, but I love rum, and I love this one. I pour it in an espresso cup with an ice cube and drink this delicious adult beverage after dinner. The name makes me giggle too. 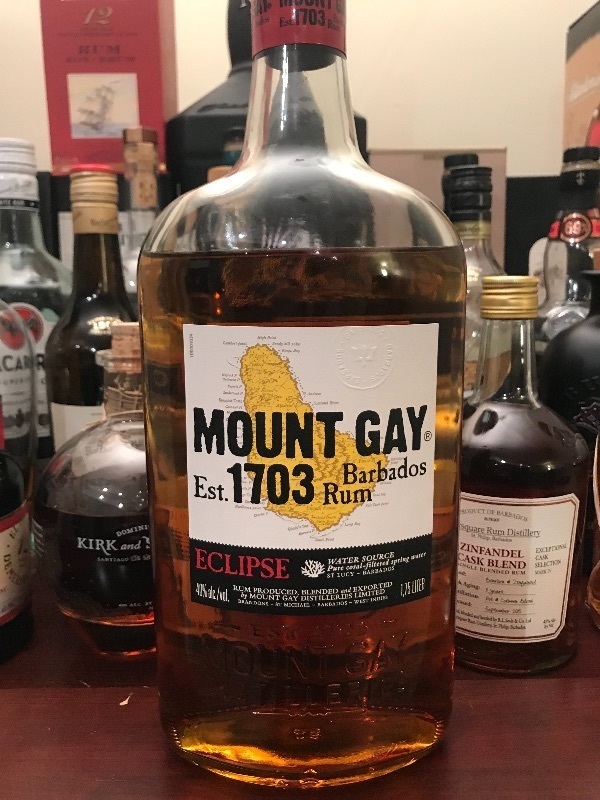 Mount gay rum Eclipse je skvelý rum, ktorý sa hodí do miešaných nápojov. Samostatne je piteľný avšak len v obmedzenom objeme. Fľaša: dizajn fľaše je typický pre barové pulty. Hrubé oblé sklo s typickými znakmi producenta. Fľaša je ozvláštnená embosovaným logom producenta na etikete a popisom produktu na skle fľaše. Vôňa: vo vôni cítiť štipku vanilky ale aj kože, vône prebíja alkoholová aróma. Chuť: ostrosť alkoholu trocha prebíja ostatné vône. Záver: ide o rum, určený hlavne pre miešané nápoje, mne chutil v dark & stormy a cuba libre. Odporúčam. Clearly part of the Mount Gay family - the Eclipse is a solid everyday rum choice. Golden colour. Vanilla aroma with caramel and some fruitiness, with a prominent alcoholic note. More clearly alcoholic in mouth, in an unbalanced way. The flavours are predominantly oak and banana, with some biscuit-like hints. It starts off quite harsh in terms of the alcohol bite, but after a bit it is not that bad after all. I can imagine it being better when mixed, perhaps. Relatively dry, mild to medium body, borderline sipping rum. A few flavours of caramel and vanilla but overshadowed by the alcohol taste. Better to be mixed. Can’t name a better rum to sip on while getting back to basics with a couple homies. Shrnutí:	Ochutnáno při posezení s kamarádem v českolipském Baru/Kavárně Kocour. Je to takové nijaké, dřevité, hodně slabý zážitek, ale rum to asi připomíná. To v Božkově umějí z náhražek udělat lepší pití. So I am in the liquor store, looking over the poor selections of rums and some guy buzz's in front of me grabs a bottle of Monarch rum ,$ 7.95 , bottom shelf, so I say Hey for $4.00 dollars more you can get Cruzan made in the carribean, not in Hood River ,Oregon, here I'll even give you the $4, So he looks at me like I'm nuts rushes up to counter and leaves to go start a fire with the Monarch lighter fluid. Interesting but not special. Solid value and mixes well but would prefer more depth overall. Beware, sipping can numb your tongue. We mix it. We drink it straight. It goes in with a Diet Coke. What can I say? We are sailors. And sailors drink a lot of Mount gay rum eclipse! Can't say I've given this rum much of a chance. Just didn't give me what I thought I was going to get. After reading some of the reviews and going over it again I can see why I was wrong. This has a very estery flavor and aroma. My first nosing was highly reminiscent of nail polish remover, but I attributed it to ethanol. After some time rolling it around in my mouth it took on a much different character. This is the fruity funk you look for in Jamaican rum, but without the fullness of flavor and aroma you get from Smith & Cross. Still funky though. Added a splash of white rum to it and those esters cut through that like a hot knife through butter, but brought more than banana to the party. This rum will be an excellent addition to a painkiller or zombie. very soft and velvety body. Not too sweet like Plantation. This is even sippable on its own like I am doing right now. Very slight boozyness...but nothing unbearable.